Got a crab cake and waffle, came with Pop Chips. Crab cake was delicious. I prefer my waffle to be crispier. But for the money, I would expect either a whole waffle instead of a 1/2, or a larger crab cake. Huge range of fragrant, delicious waffles. Stopped by with my family of 4 - including two picky kids and a anti-sweet-tooth hubby. Everyone was happy. Also try the interesting, dry sodas in flavors like cumcumber. In general, this food truck likes to turn tradition on its head with sophisticated taste! I wasn't so sure about waffles for lunch but I was pleasantly surprised! I'd go back for more it was yummy! 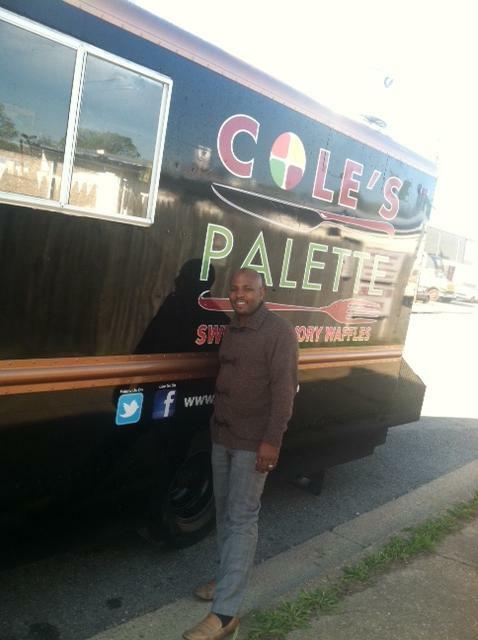 Cole’s Palette is a Montgomery County, Maryland food truck serving gourmet meals featuring sweet and savory waffle sandwiches. They first started serving on April 14, 2012.